I've not traveled much since we bought our new house in Raleigh, adopted a dog, and become a slave to the traditional school schedule where we only have our summer off to explore. Last weekend, I was finally back on assignment in the off-season. After seven years of owning this blog, Will and I have an unspoken blog agreement. Paid gigs get my priority when it comes to my time. Additional writing perks such as media visits come second to my first job of managing the household and being a parent. Media writing assignments are for when I burn the midnight oil, if and when I have extra time. And let's face it! 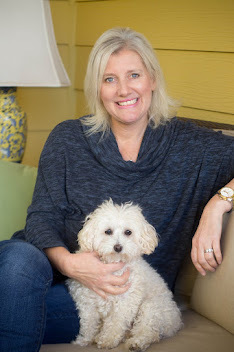 As an almost 50-year-old menopausal woman with an 8-year-old and a 12-year-old, I'm exhausted most of the time and there is no "burning the midnight oil" in this house these days. 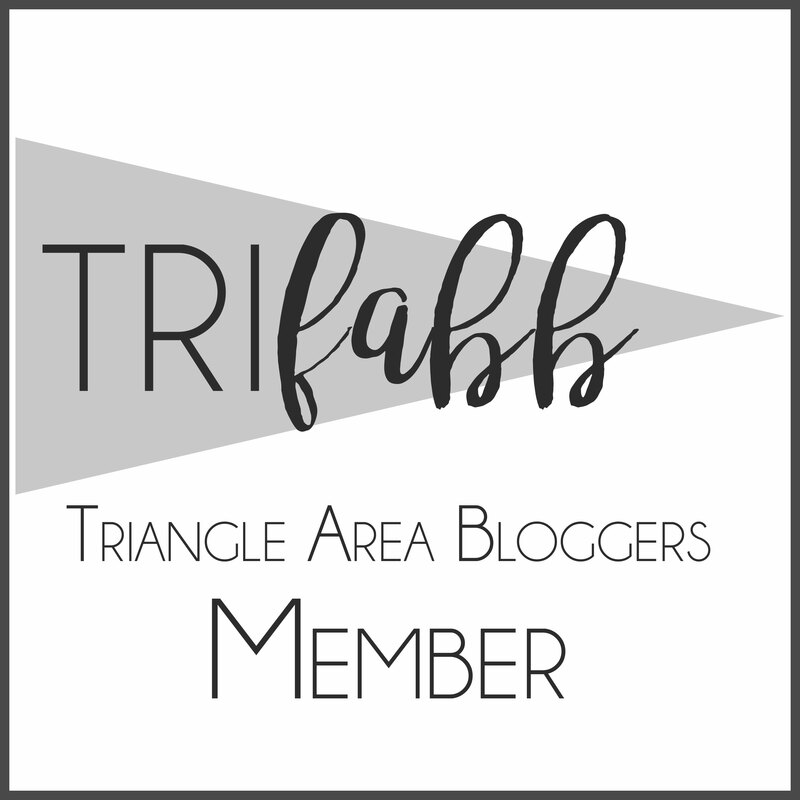 The invitation to visit the AC Hotel in Raleigh North Hills came at the perfect time in my life because I needed a hotel stay to renew me and awaken my senses to escape the ordinary in my life. The best part of all is that I only had to drive 15-minutes to experience all of this in my hometown. The AC Hotel by Marriott is hotel brand that I've been curious about but had no personal experience. 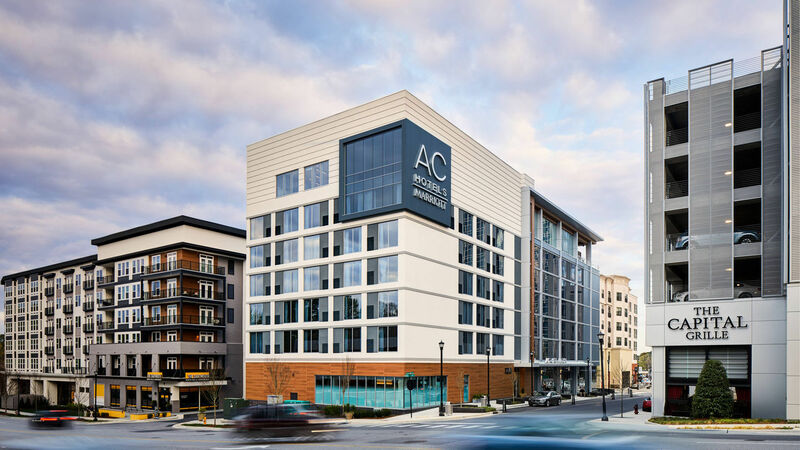 Last year, Raleigh's North Hills area was the first site in North Carolina to open the AC Raleigh Hotel. Asheville and Chapel Hill followed suit later in the year with two more properties. 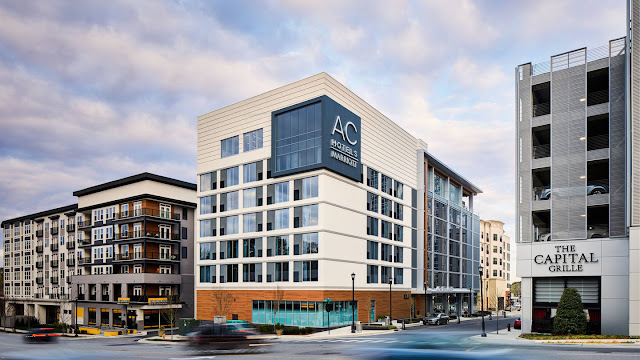 Charlotte, NC will open the fourth AC Hotel in North Carolina this spring. I had no idea that the AC Hotel was the perfect brand choice for me. It's the first time other than staying in a Ritz-Carlton brand that I've walked away feeling totally impressed. The AC Hotel is nothing like the Ritz-Carlton brand, but it appeals to me because of its European influence, I think. From handing over the keys to the valet to checking into my room, the hotel help transform my senses to a peaceful state of mind. I felt as if I belonged there. Surprisingly, the AC Hotel Raleigh created a special euphoric ambiance that made me feel 15 years younger and carefree. The brand is typically touted as an urban oasis in the heart of a thriving city. It's sophisticated. Modern. Practical. It's exactly what a traveler needs without all the fussiness. Honestly, I cannot really put my finger on why I like it so much, but it evokes a feeling of happiness in my senses. I'm comforted being there and want to experience it again. Gen X travelers like myself may be a little confused at first when they step into a guest room. 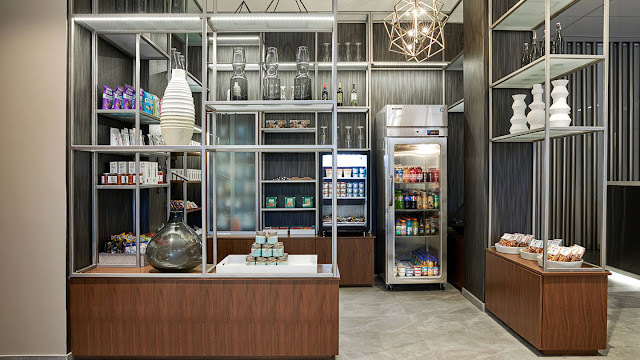 It may take several minutes to figure out how to turn on all the lights and operate a telephone that connects you to the front desk with no buttons. It may take us awhile to figure out the TV. There is a lot of streaming going on, but the longer you stay in these modern rooms, the more you fall in love with the AC Hotel Brand. The artwork. The design. It's a place that awakens your senses. It's aesthetically pleasing and it feels fresh, clean and modern. Whether you are an overnight guest at the AC Hotel North Hills or just in town for a few hours, come hang out with the locals at the coolest hangout in the city. This indoor-outdoor space has panoramic views of North Hills with the snazziest heat lamps I've ever seen. 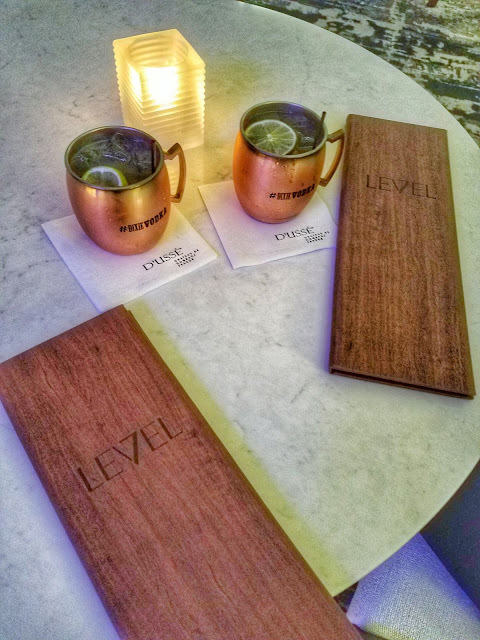 The AC Hotel brand prides itself on the latest in mixology trends and local spirits. In the AC Hotel brand, the bartenders act like the concierge. They know the city. They know the places to go and they can whip up a darn good cocktail at the same time. I splurged on not one, but three cider mules. I think that may be my drink of summer. The North Hills area is filled with restaurants and entertainment, however, I chose to dine on Spanish influenced tapas for my dinner. I am so glad I did. The menu at Level 7 is not extensive, but what they do have, it is prepared well. As a local, I will be back because I was that impressed. However, if you stay at the hotel, you are guaranteed to be able to experience the atmosphere. 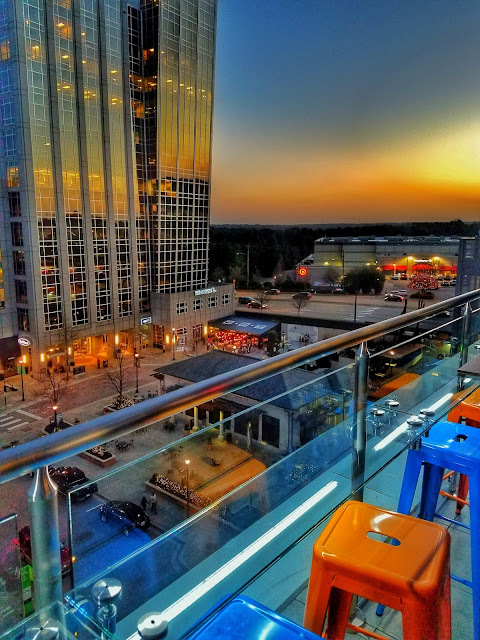 If you are not an overnight guest at the AC Hotel North Hills, keep in mind that there could be a waiting list to get up on the rooftop, especially on weekends and great NC weather days. 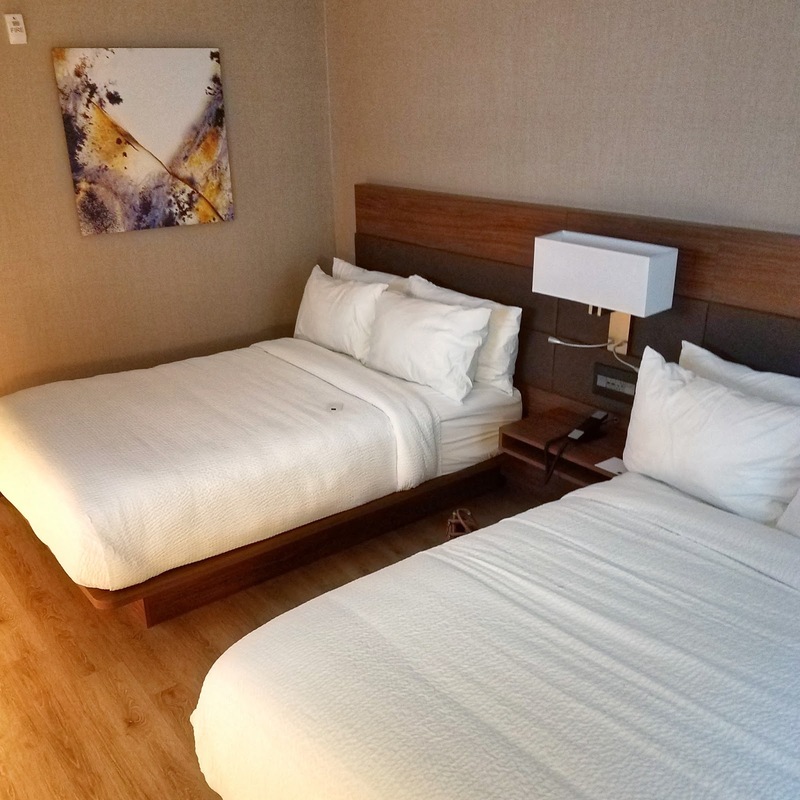 The rooms at the AC Hotel North Hills by Marriott score big points on functionality and comfort. The beds, the cozy bedding is all that you should expect from a good hotel, but where they go up and beyond is in hotel design. I love the hardwood floors. I'm shouting it to the rooftops. I love the cleanliness of the hardwood floors. Carpets can get yucky quickly and as you walk on a carpeted floor, you cannot help but think about the feet that walked those rooms before you. The hardwood floors scream clean. I loved them. The bathroom is a good size, but the star of the show is the shower and its rainforest shower head. Bravo. Now that is a shower. I've studied the brand and the showers in Raleigh may be slightly more lux than other properties. My first experience of a hydration station was at a very modern hotel in Toronto. I loved the concept there and am so glad that the AC Hotel North Hills brought the concept to Raleigh. I do not know what it is about traveling, but I sometimes feel as if I'm in the desert and I just cannot get enough water. I don't like getting water from bathroom sinks. I hate it so the hydration station with water carafes impressed me immensely. All hotels need to take a cue from this brand on this. I love the Ritz Carlton so much because they pass out bottled water all the time, but I think I love the hydration stations even more. The continental style breakfast buffet is $16.00 and I have to admit this is the most refreshing breakfast buffet I've seen since my time staying in Europe and Canada. From croissants flown in from Paris to the egg of the day, this breakfast buffet screams fit and healthy. I love it. They make the best chia pudding. 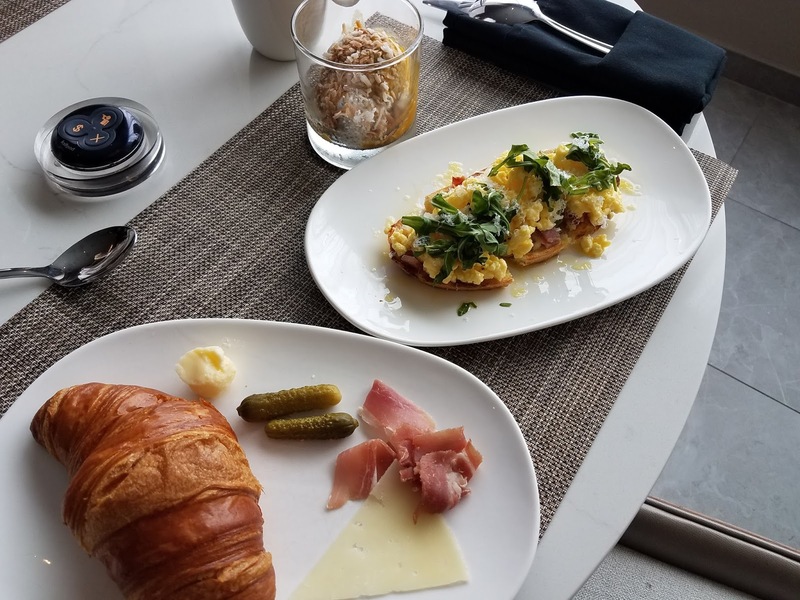 The breakfast is pricey for a continental-inspired breakfast and American kids may not love it at first, but I think it is a true European breakfast experience because of the baked pastries, healthy fats, proteins, cheeses, and meats. I am a huge fan of his hotel's breakfast spread. AC Hotels by Marriott are typically located in prime spots in a city. This AC Raleigh North Hills location is within walking distance of boutiques, restaurants, grocery stores, spa and beauty services plus entertainment venues such as cinema and upscale bowling. With a quick exit off the Raleigh beltline, you can get to most areas of the Triangle with ease. 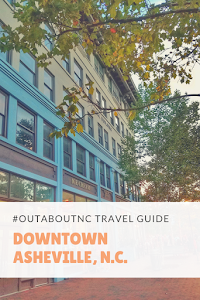 It's about twenty minutes to Raleigh-Durham-International Airport and about 15 minutes to downtown Raleigh which houses the city's capitol building, convention center, and state museums. In less than 20 minutes, you can travel to Raleigh's sporting complexes such as Triangle Aquatic Center, the PNC Arena in Raleigh, and the WakeMed Soccer Park. The USA Baseball Training Center in Cary is less than 30 minutes away from this AC Hotel North Hills location. Overall, this is a top location for staying in Raleigh on business or vacation. One hotel guest I spoke to was working in Durham on business but chose to stay at this location. The hotel is about 40 minutes away with traffic to the Durham Bulls stadium and the Durham Center for Performing Arts. And just a couple of notes. Parking is not that easy on the property so valet parking will take away some headaches for overnight guests. It's a $22 charge per night. Certain AC Hotels are pet-friendly. This location in Raleigh's North Hills is not pet-friendly so you will need to check each hotel regarding pet policies before booking. Rates can also vary by city. This particular North Hills hotel location begins around $175 which is several hundred dollars less than the Asheville city market. The hotel has a nice fitness center and a Sundry/convenience store with local snacks and provisions for those days you are on the go or want to chill in the comfort of your hotel room. No doubt, the AC Hotel by Marriott is a new way to hotel for the Gen X traveler and I like it. I will seek out the brand again and it's a great choice for visiting Raleigh. Disclosure: This story was part of a media visit to experience this hotel. My only personal expense was valet parking.